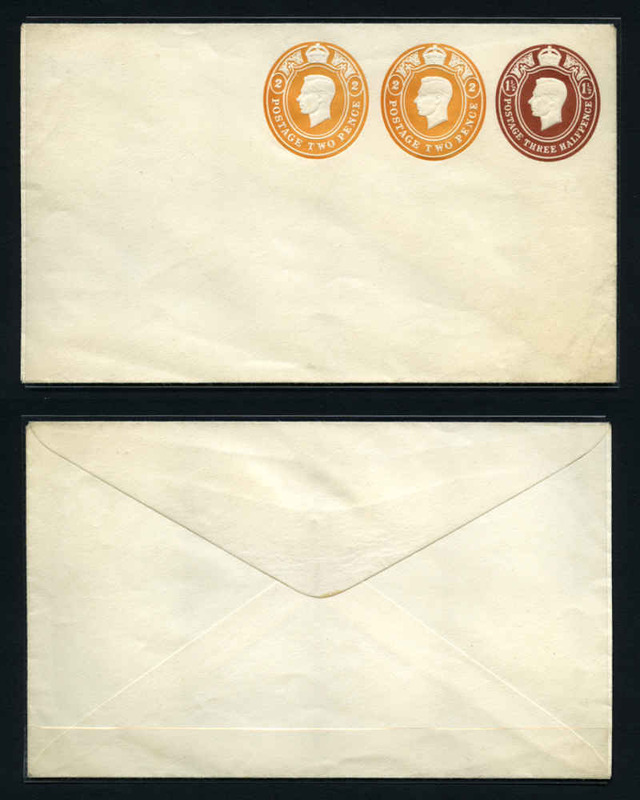 Selection of 62 embossed envelopes from 1920 to 1956 including 17 registered and several PTPO envelopes with small range of company advertisements and logos. Noted 1926 1½d Scarlet KGV Octagon double rate registered envelope with "Urgent Letters"/For Immediate Delivery/By/Telegraph Messenger sticker, 1928 1½d Scarlet OS KGV Octagon OHMS window envelope, 1920's 1d Green KGV PTPO Octagon with The Bunyip Soap Co "EVEN A MAN CAN DO IT" advertising window envelope and 1930 Two Pence on 1½d Scarlet KGV Octagon with POSTED IN LATE FEE BAG straight line postal marking. Also 7 postcards and 6 registered letters from 1921 to 1943 including 1942 5½d Brown KGV registered letter with text in red and flap at right. (3). Mainly fine condition. Selection of 195 mint PSE's with a Face Value of $47.50. Also 1980 22c Tarcoola PSE cancelled on FDI with Port Augusta special postmark. 1976 Red (6), 1978 Blue (5), 1981 Brown (10), 1982 Black (10) and 1982 Natural Heritage (6) postcard packs. One of each 1978, 1981 and 1982 Natural Heritage packs cancelled FDI. 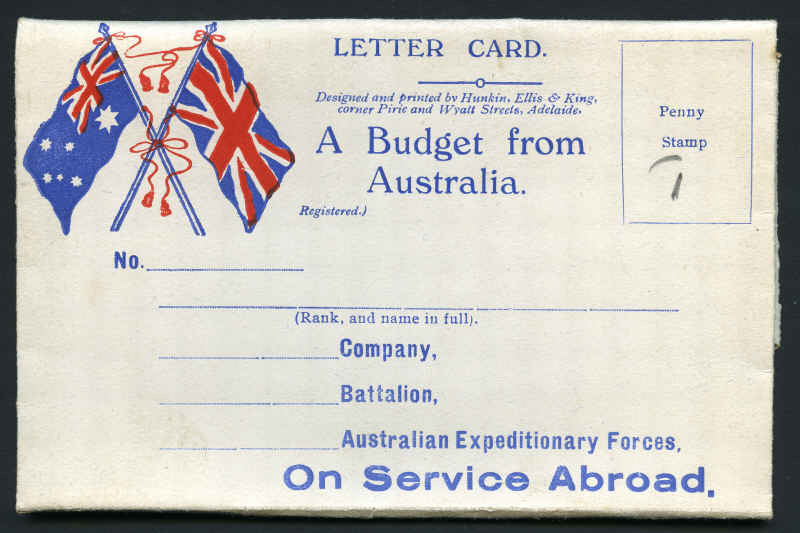 WWI Letter Card with "A Budget from Australia, Australian Expeditionary Forces, On Service Abroad" and Australian and British flags on front unused. 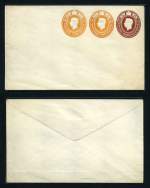 Reply Letter Card "Keeping the Flag Flying" on reverse, with zig-zag type roulette, designed and printed by Hunkin, Ellis & King, corner Pirie and Wyatt Streets, Adelaide.